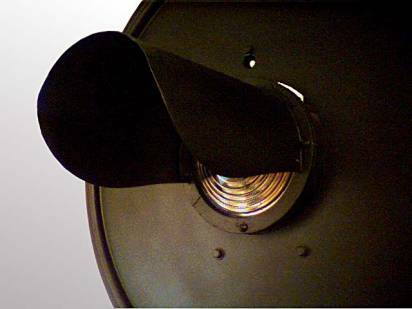 The Type SA searchlight signals made by the General Railway Signal Company come in two styles.� The first GRS style is referred to as the �stepped lens� style having a single outer lens with concentric prisms or steps to focus the beam leaving the internal unit.� The outer stepped lens usually contains a center deflecting bulls-eye as well.� This style is similar to the US&S �H� style searchlight signal, although the H style has a slightly curved inner doublet.� The second GRS style is referred to as the �compound lens� style which has both an inner doublet lens and a smooth prism-less outer doublet lens.� The compound lens style has a separate close-up prism located between the inner and outer doublets.� This style is very similar to the US&S �H-2� style searchlight signal.� For more general information, see US&S Searchlight Signals and US&S Searchlight Signal Styles. 1.� Compactness permitting the signal to be located where clearances are very limited and where other types of signals cannot be used. 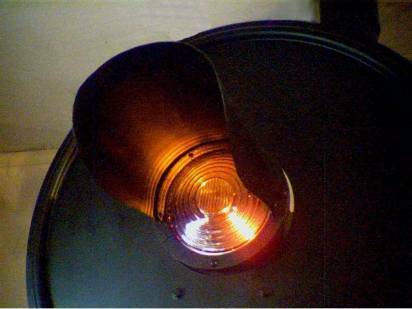 3.� Efficiency more than double that of color light signals. 4.� A relay mechanism biased by gravity to produce a danger indication when the control current is cut off. 5.� No false phantom indication can occur since all extraneous light entering the signal before being reflected must pass through the color roundel used to set the aspect of the signal.� This extraneous light includes both sunlight and light from locomotive headlights. 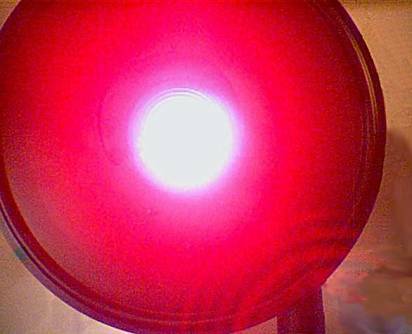 6.� The same lamp is used to project all three indications providing a constant check on the ability of the signal to give its most restrictive indication. 7.� The signal may be controlled directly over the line, thus reducing the number of relays required and simplifying the circuit. 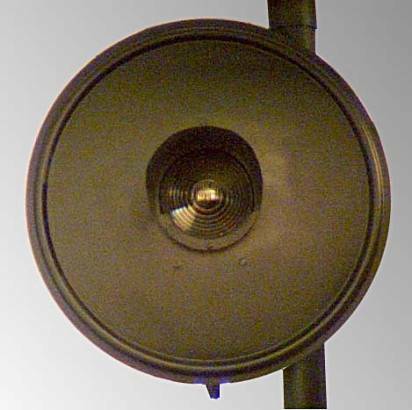 Given the general demise of the searchlight signal, the railroads must have determined that these advantages were outweighed by the searchlight signal�s higher maintenance costs. Three photos above.� GRS SA stepped lens style searchlight signal displaying red, yellow and green aspects.� The camera is positioned outside of the beam of the signal. 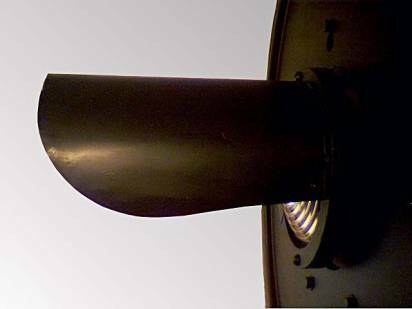 Above and left.� Stylistic visor characteristic of GRS signals.